Problem 1: NO OBJECTIVITY – If you sell hammers, declaring 2014 the “year of hammers” isn’t just self serving, it’s probably plain wrong. Great trends should take an unbiased look across industries to describe an idea that really matters. Problem 2: NO CREATIVITY – Trends need to do more than repeat common knowledge. For example, saying that “more people will buy tablets in 2014” is obvious—and useless. Instead, great trends should describe the world in fresh ways you haven’t heard before. Problem 3: NO PROOF – Sharing a trend with-out specific examples is like declaring your- self a musician by simply buying a guitar. Great trends are only important when there are real life examples and stories that illustrate how it is actually happening in the world. Problem 4: NO APPLICATION – Even when a trend seems to make sense, the place that many trend articles stop is at trend “spotting.” In contrast, great trends should be paired with real advice on how to them to impact your business. For the past four years, I have spent a bulk of every year gathering information to curate into an annual trend report that aims to solve each of these problems by taking an unbiased creative and proven look at the trends that will matter in each year … and pair them with some real advice and action guides for how to actually use them. The first three editions of this report have been viewed and shared online more than half a million times. 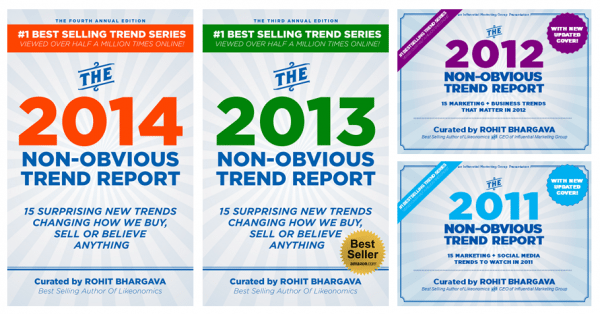 Today I’m officially publishing the 4th Edition of this report – The 2014 Non-Obvious Trend Report. Embedded below is a 139 page sneak peek of the full report with many of the insights, stories and descriptions of 15 trends that will matter in the coming year. The report shares my approach to “trend curation” versus trend spotting – and brings together nearly a year’s worth of research into a single book. I hope you enjoy this preview of the full report – and it inspires you to download the full report which is available as an ebook for just $4.99 on Amazon right now. As a companion to the report, I have also launched a trend site that compiles all the previous editions of the report and details about several other “15 Trend” books that are now available. After reading them, if you are interested in joining my reviewer list to get early access to my 2015 Trend Report later this year, as well as several other bonus pieces of content – you can sign up for that below as well. Company, Twitter Name, Or Any Other Key Info!